Chilling dash cam footage has emerged of a three-minute struggle between a suspect and a Brooklyn Park, MN, officer. During the incident, the officer’s gun discharged before backup arrived and the assailant was subdued. 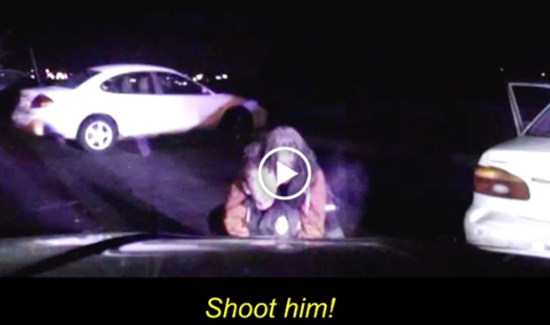 The video begins innocuously as a Brooklyn Park police officer responds to a complaint of noise coming from a parked car, then returns to his squad for a warrant check. Within minutes, it becomes indisputable footage of a cop’s fight for his life as he is repeatedly punched in the head, then placed in a chokehold. “[Expletive] kill you!” 25-year-old Lance Carr screams as he grabs for officer Sean Hyman’s gun. His voice hoarse with fear and exhaustion, Hyman, unable to reach his radio, screams for help at least 20 times. A bewildered dispatcher, unable to hear him, asks if he is “still good” and for a status update. Then Hyman’s gun goes off. The chilling nine-minute video, captured on Hyman’s squad car dash camera, could have ended far differently, authorities said at a news conference Thursday, one day after Carr was convicted of first-degree assault in connection with the late-night confrontation on Nov. 29. “Every time I watch it, I think the officer is going to die,” Brooklyn Park Mayor Jeff Lunde said.